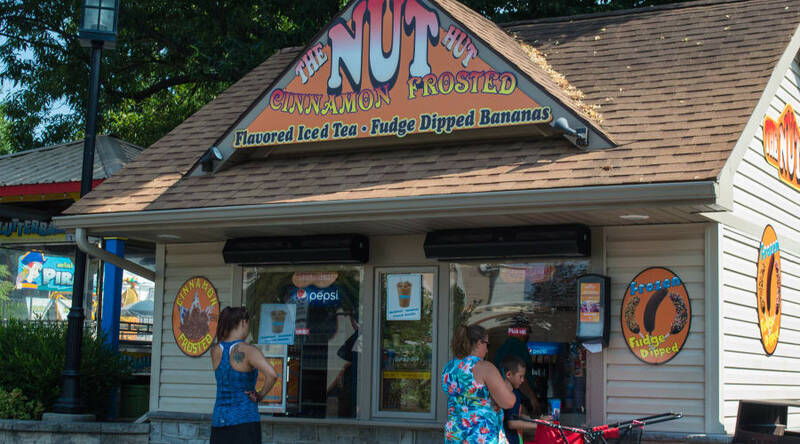 You'll smell the delicious roasted nuts, from the Nut Hut in the Founder's Way℠ area, before you can even see them! Some are salted, some are sugar-coated, but all of them are delicious! Fudge dipped bananas are also available here! Raw almonds, raisins (oil treated), honey peanuts (Peanuts, sugar, honey, wheat starch, malodextrin, peanut oil, salt, xanthan gum), Reese�s pieces (sugar, partially defatted peanuts, partially hydrogenated vegetable oil (palm kernel and soybean oil), corn syrup, dextrose, contains less than 2 % or less of the following: artificial color (yellow 5 lake, red 40 lake, yellow 6 lake, blue 1 lake), salt, resinous glaze, soy lecithin, modified cornstarch, carnauba wax, vanillin, artificial flavor, milk. Dried fruit (pineapple, sugar, sulphur dioxide, raisins (vegetable oil, palm and sunflower oil), apricots (apricots sulfates, dates, dextrose), craisins, (cranberries, sugar, sunflower oil), Papaya (papaya, sugar, sulphur dioxide, USFD&C yellow 5 &6), Apples (apples, sodium metabisulfite), Components: Pineapples, Raisins, Golden raisins, Apricots, Dates, Craisins, Papaya, Apples. Packaged in a facility that also processes products containing: peanuts, tree nuts, soybeans, milk, egg, fish, crustaceans shellfish and wheat ingredients.